The glow plug is warmed up. The metering pump conveys fuel. The burner motor starts smoothly. The fan delivers combustion air. Fuel-air mixture ignites (flame formation). The hot combustion gases flow through the heat exchanger that delivers the heat to the coolant system of the vehicle's engine. The heater is controlled electronically and works - according to heat requirement - in several power stages. 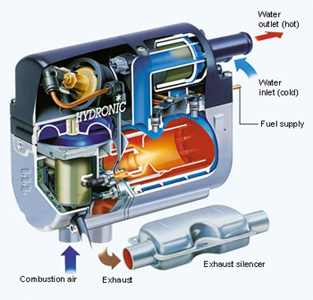 Hydronic cooling heaters use a system of diesel combustion that provides safe, consistent heat to a vehicle’s cooling system, allowing it to operate effectively in cold weather climates. These systems are incorporated into the vehicle's engine cooling system. The thermal energy of the hot water that is circulated in a cooling system is captured in the Espar Hydronic Coolant Heater, and is then distributed by the automobile's own heat exchanger to the interior and engine compartment of the vehicle by the vehicle's existing air vents. This system uses remote starters to effectively warm up an engine, while it’s user enjoys a few extra minutes inside. Because the system makes use of the existing thermal heat of a vehicle's cooling system, it greatly increases efficiency while achieving the same effect as an idling engine.